Deck Safety Tips: Don’t Turn Off the Light! 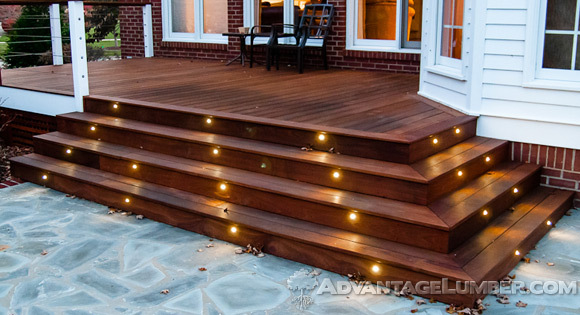 See your deck in a new light with Advantage Deck Lighting! This time of year brings good weather well into the night. This could mean a lot of late night parties, or get togethers. When we spend more time outdoors at night, we need adequate lighting to maintain a reasonable level of safety. This is why it’s important to have enough working lighting available so you can keep the party going as long as you’d like. Cleaning the lights is a way to brighten up your space immediately. Chances are your deck hasn’t seen a foot on it in months, which is plenty of time for dirt and grime to plaster itself on the fixtures. Refer to your owners manual for the best course of action for cleaning any light fixtures. If you have existing lighting, make sure it’s all in working order. It’s been a while since you’ve used your deck, so there is the possibility plant life or trees have overtaken certain areas of your deck. Trim these up as necessary. One extremely important item to look for with lighting, that can be easily overlooked, is to check all of the electrical outlets. Find out your local building codes and see if your outlets are up to date. If children are going to be present, the outlets MUST be childproof. Clean the outlets, if necessary, and check to make sure they’re waterproof. You never know what summer weather can bring. If you have to use electrical extension cords, first make sure they are approved for outdoor use. Place them out of traffic areas and keep them secure so they don’t pose a tripping hazard. If you do not have sufficient lighting on your deck, and maybe even your walkways, it’s important you install some. Not only does this add safety, but it allows you to enjoy your outdoor space as long as you’d like. This year we started carrying a new line of deck lighting products! Our lights are available in a variety of colors and designs. They all come with the benefits of being easy-to-install, energy efficient, and versatile in all weather conditions, while creating the desired ambiance for your outdoor space. If you are unsure about how to install lighting, it’s crucial to contact a local licensed contractor/electrician who is familiar with outdoor, electrical installation. Lighting is not something to take on by yourself, especially if you don’t have a certification for the process. So go ahead, throw that late night party and enjoy your deck until the sun comes up! This entry was posted in Deck Design, Deck Lighting, Deck Safety on June 18, 2013 by Mr. Ipe Hardwood.